The sun is shining and it's going to be a beautiful day. I normally don't do any handwriting on my cards, but I wanted to show you that even if you don't have a stamp that says what you want it to say or you don't rubber stamp at all, you can still add a sentiment. Supplies: Very Vanilla cardstock-stampin' up!, Black Bazzill Cardstock, Ribbon-Making memories: 5th Avenue; Old Olive Stampin' Write Marker-Stampin' Up!, SuperNove Fine Glitter-Stampin' Up! 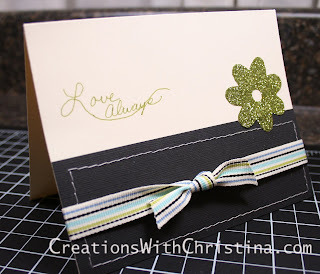 ; Sweet Cuts-Stampin' Up!